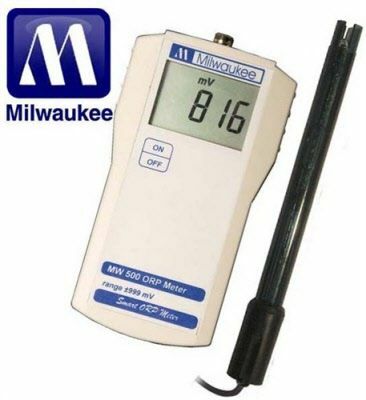 Testing the Negative Properties of drinking water and fish tanks has never been easier with the Milwaukee Instrument ORP meter. The MW500 meter makes a great addition to your water testing arsenal. MW500 performs ORP measurements with a range of ±1000 mV. Compact pH, ORP and Temperature Portable Meters with Faster Micro Processor. These handy and ergonomically designed portable meters are ideal for anyone working on a low budget and still requires fast and reliable measurements. These portable meters are suitable for a wide range of applications, such as Educational, Agriculture and Horticulture, as well as water and environmental analysis. These easier and faster to calibrate portable meters have a smaller, ergonomic and lighter case design. Other features include 100% larger and easier to read LED Display and long battery life. Supplied with a MA921B/1 Platinum Electrode amd 1 X 9V Battery. • To prolong the life of the electrode, place a small, clean sponge or tissue in the bottom of the cap, and pour some electrode storage solution (or pH 4 buffer) into the cap. • Never let probe dry and Never use distilled/deionized water for storage purposes. Important Note: The SM500 is discontinued and replaced with the new MW500. The new "MW" product group all have these new or improved features: Faster Processor with the new chipset amp; motherboard. Smaller, ergonomic amp; lighter case design. 100% larger amp; easier to read LED display. Easier and faster to calibrate. Longer battery life.